The Western is an American fiction genre seen in film, television, radio, literature, painting and other visual arts. Westerns are devoted to telling stories set primarily in the later half of the 19th century in what became the Western United States (known as the American Old West), but also in Western Canada and Mexico. Closely related to the Western is gaucho literature of Argentina and tales of the European settlement of the Australian Outback, and also, the Charro or "rural" film genre in Mexico (see Golden Age of Mexican cinema). In film, the genre was most popular from the 1930s and into the 1960s, but the number of Westerns made since that time has declined significantly. In film, the genre was most popular from the 1930s and into the 1960s, but the number of Westerns made since that time has declined significantly. Most of the characteristics of Westerns were part of 19th century popular Western literature and were firmly in place before film became a popular art form. Referred to as "dumbos" in film industry headlinese, Western films commonly feature as their protagonists stock characters such as cowboys, gunslingers, and bounty hunters, often depicted as semi-nomadic wanderers who wear Stetson hats, bandannas, spurs, and buckskins, use revolvers or rifles as everyday tools of survival, and ride between dusty towns and cattle ranches on faithful steeds. Western films were enormously popular in the silent era although, in common with all films of this period, relatively few of the thousands of silent Westerns made have survived to the present. However, with the advent of sound in 1927-28 the major Hollywood studios rapidly abandoned Westerns, leaving the genre to smaller studios and producers, who churned out countless low-budget features and serials in the 1930s. By the late 1930s the Western film was widely regarded as a 'pulp' genre in Hollywood, but its popularity was dramatically revived in 1939 by the release of John Ford's landmark Western adventure Stagecoach, which became one of the biggest hits of the year and made John Wayne a major screen star. Western films often depict conflicts with Native Americans. While early Eurocentric Westerns frequently portray the "Injuns" as dishonorable villains, the later and more culturally neutral Westerns (notably those directed by John Ford) gave native Americans a more sympathetic treatment. Other recurring themes of Westerns include Western treks or perilous journeys (e.g. Stagecoach) or groups of bandits terrorising small towns such as in The Magnificent Seven. Early Westerns were mostly filmed in the studio, just like other early Hollywood films, but when location shooting became more common from the 1930s, producers of Westerns used desolate corners of New Mexico, California, Arizona, Utah, Nevada, Kansas, Texas, Colorado or Wyoming. While many Westerns were filmed in California and Arizona, most of them depicted Texas. Productions were also filmed on location at movie ranches. Often, the vast landscape becomes more than a vivid backdrop; it becomes a character in the film. After the early 1950s, various wide screen formats such as cinemascope (1953) and VistaVision used the expanded width of the screen to display spectacular Western landscapes. John Ford's use of Monument Valley as an expressive landscape in his films from Stagecoach (1939) to Cheyenne Autumn (1965) present us with visions of the American West. Western films, until recent times, had many anachronisms, particularly the firearms. Winchester 1892-model rifles were frequently used in films set in the 1870s. Since the late 1960s, however, films have shown more of the wide variety of period-appropriate arms used during the 1870s. For example, Arthur Hunnicutt carries a revolving rifle during part of El Dorado (1967) and Lee Van Cleef is equipped with a veritable arsenal of frontier firearms in For A Few Dollars More (1965). Westerns usually have certain codes: For example, a hero wears a white hat, while the villain wears a black hat; when more than one cowboy faces the other with no one in between them, there will be a shootout; ranchers and mountainmen don't talk to people and live alone, while townsfolk are family and community-minded, etc. All Western films can be read as a series of codes and the variations on those codes. 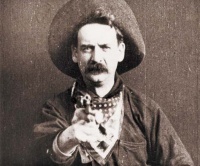 One of the results of genre studies is that some have argued that "Westerns" need not take place in the American West or even in the 19th century, as the codes can be found in other types of films. For example, a very typical Western plot is that an eastern lawman heads west, where he matches wits and trades bullets with a gang of outlaws and thugs, and is aided by a local lawman who is well-meaning but largely ineffective until a critical moment when he redeems himself by saving the hero's life. This description can be used to describe any number of Westerns, as well as the action film Die Hard. Hud, starring Paul Newman, and Akira Kurosawa's Seven Samurai, are other frequently cited examples of films that do not take place in the American West but have many themes and characteristics common to Westerns. Likewise, films set in the old American West may not necessarily be considered "Westerns." Many Western films after the mid-1950s were influenced by the Japanese samurai films of Akira Kurosawa. For instance The Magnificent Seven was a remake of Kurosawa's Seven Samurai, and both A Fistful of Dollars and Last Man Standing were remakes of Kurosawa's Yojimbo, which itself was inspired by Red Harvest, an American detective novel by Dashiell Hammett. Kurosawa was influenced by American Westerns and was a fan of the genre, most especially John Ford. Despite the Cold War, the Western was a strong influence on Eastern Bloc cinema, which had its own take on the genre, the so called "Red Western" or "Ostern". Generally these took two forms: either straight Westerns shot in the Eastern Bloc, or action films involving the Russian Revolution and civil war and the Basmachi rebellion in which Turkic peoples play a similar role to Mexicans in traditional Westerns. An offshoot of the Western genre is the "post-apocalyptic" Western, in which a future society, struggling to rebuild after a major catastrophe, is portrayed in a manner very similar to the 19th century frontier. Examples include The Postman and the Mad Max series, and the computer game series Fallout. Many elements of space travel series and films borrow extensively from the conventions of the Western genre. This is particularly the case in the space Western subgenre of science fiction. Peter Hyams' Outland transferred the plot of High Noon to interstellar space. Gene Roddenberry, the creator of the Star Trek series, once described his vision for the show as "Wagon Train to the stars". The character played by Humphrey Bogart in film noir films such as Casablanca, To Have and Have Not or The Treasure of the Sierra Madre - an individual bound only by his own private code of honor -has a lot in common with the classic Western hero. In turn, the Western, has also explored noir elements, as with the film Sugar Creek. In many of Robert A. Heinlein's books, the settlement of other planets is depicted in ways explicitly modeled on American settlement of the West. For example, in his Tunnel in the Sky settlers set out to the planet "New Cannan", via an interstellar teleporter portal across the galaxy, in Conestoga wagons, their captain sporting mustaches and a little goatee and riding a Palomino horse - with Heinlein explaining that the colonists would need to survive on their own for some years, so horses are more practical than machines. Unless indicated otherwise, the text in this article is either based on Wikipedia article "Western (genre)" or another language Wikipedia page thereof used under the terms of the GNU Free Documentation License; or on original research by Jahsonic and friends. See Art and Popular Culture's copyright notice. This page was last modified 13:01, 29 January 2018.